Welcome to our first Question and Answer session for the currently running story arc (which begins here). I’m really eager to hear your thoughts and answer any questions you have. The way this works is you will need to post your questions as comments to this post. You can do so anonymously or you can register with the site. Also I”ll be moderating any questions before they appear in the comments section (to prevent trolling) and approving them as quickly as possible. The Q&A will remain open through the rest of the story arc (and for a brief period afterward) so feel free to take your time. Once I feel we’ve gathered enough questions I’ll answer them to the best of my ability and post the results here and on Facebook. Thanks for participating and as always thanks for reading. Thank you for the Q&A! 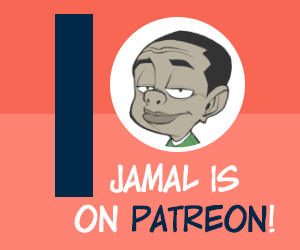 About Jamal: Let’s face it, he looks older than his actual age. The hairline and forehead-wrinkles fool me on the regular. Was this done to emphasize his jaded, worldly-wise take on things (a kid reacting like an adult and not like a child is a humour staple, after all), or was there another reason for his appearance? The reason for Jamal’s looks is two-fold. It’s partly inspired by Bill Watterson’s Calvin at his most expressive. The extra lines help exagerate his expressions. The second reason is that it IS meant to age him. This is a not-so-subtle comment on the way society projects an unwarranted maturity on children of color. A tall 12 year old is often seen as and treated like grown man (up to and included being tried as an adult in court). 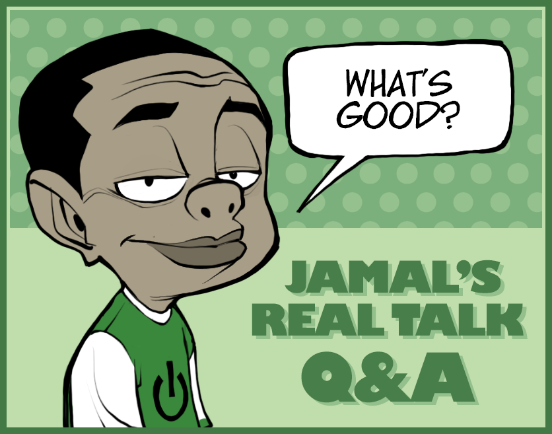 Jamal’s somewhat “weathered” looks are a reminder of that. Early in this story arc, when the cop approaches them, the tone is humorous and still has punch lines (the cop thinking about how he’s definitely winding up on YouTube, f’rex). Did you decide partway through to make it a serious storyline, or was this a deliberate artistic choice to emphasize the horror of what came next? Either way, what motivated this decision? My intent was to give the story a more serious tone when it was warranted. I want the comic to have the flexibility to be both dramatic and comical. But I also wanted the reader to have a very specific experience. The pacing and tone were meant to be relentless, unexpected and even a little off-putting. It was my hope that readers would experience parallel sets of emotions. Those inspired by the story and those inspired by reading a comic that takes such a brutal and unexpected turn. Did no one else come to the church that day? Lot’s of people would have come of course. But I wanted to illustrate how lonely it feels to lose someone close to you. Good to be here Tauhid, thanks for this! Me, I’m wondering if and how other peoples perceptions have changed over the years and what comes up for you in personal situations of bigotry/predujice/racism? The last few years, among other things, I have really surprised myself with all the ways I contribute to systemic racism without even knowing it. Starting with an example of something that seems fairly minor ( though every brick in the wall counts, does it not?) I have been purging my vocabulary and am surprised at all the things I say, that were picked up in childhood and passed on from family and friends, that are steeped in racism. I parroted these words and phrases, not even realizing they were racist and, when saying them, had no intention of being racist or even simply a jerk. They were just turns of phrase, plain and simple, no ill intent, and yet, there they were, ignorance or not, they were still cutting. It was years before the light went on and I realized this saying was not referring to the life span of a raccoon, but was a derogatory term. Facepalm! This brings up another question as to how real and graphic I/we can be with our language here. For me, it is about intention. If I use a word here that I wouldn’t use in normal conversation, it is for clarity, not for slander, but I understand how others may feel differently. Should we censor ourselves? Just to quickly answer your question in language. I would encourage everyone to avoid profanity but wouldn’t want you to sensor ideas. I don’t shy away from the occasional curse word. Just use your best judgement and keep in mind how you want to represent yourself. Yup, on board with that. Also, how to add avatar…. clicked on “get Gravatar” below but it seems to be only for creators? Gravatar is just an avatar service. Once you’ve set up an account and chosen an image you’ll automatically have an avatar on all sites that employ it. WordPress and the Like. It’s a bit of a hassle but you can set it and forget it. This has been a hard arc for me to read. 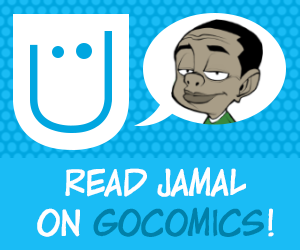 Just wanted to ask if you put it out there as a way to communicate what the reality of life is for people of color or more of a personal motivator for Jamal and his future as the comic progresses. I’m a middle aged white woman who sometimes needs reminding that the world I experience is not the same for everyone. Just a personal anecdote, my black friend and I were coming out of our building after work and we saw a white security officer “dealing” with what appeared to be a very agitated black man. We both watched the interaction as the man ended up walking away. In my mind I was thinking “thank goodness the security guy was there to deal with the situation.” But my friend said she was paying close attention because she wanted to make sure the officer didn’t do anything to harm him. We saw the same thing, but we didn’t perceive it the same way at all. It really made me think, as does your comic strip. Grace, I couldn’t come up with a more perfect example of social bias than the one you gave. Thank you for that. The reason I wrote the arc (and the reason I write the strip) is as both an outlet for my creativity and to share my values on matters of social justice. Sometimes I wonder who exactly I’m writing the strip for; the choir or the congregation. Other times I wonder if I should be preaching outside the church to people on the street. At the end of the day I just want the perspectives shared in the comic to available for anyone who enjoys comic strips. Will any of the cop’s side be shown? I am talking about the Internal affairs shooting board and the Mom testifying. I don’t want to know more about him or his so-called side. Kind of hoping we get a ghost but that might be tacky, IDK. I am talking about him being accused of a unjustified shooting and indicted. Jan, I think you’ll see that there never was a “cop’s” side. It would be nice, though, if he does reappear later and becomes a bit more fleshed-out and human. At the moment, he’s too much of a one-dimensional stereotype. I’m hoping he turns out to be Jermaine’s girlfriend’s grandfather. Been reading this since the beginning and I think it is great! Want it to be a big success but it seems like you may not be shooting for mainstream acceptance. One thing that has stuck out to me is every single white character has either been clueless or a total jerk. My question is are you trying to alienate white readers or is that simply a reflection of your worldview? Definitely encountered my fair share of white racist but also lots of cool white people too. Keep up the great work this is an important comic that needs to be out there! To be fair, most white people in real life are clueless. I do wonder if/when the white girlfriend will show up again. As commented by Mo Tom and Joy-I think most people are clueless about other races/cultures. My grandfather was somewhat to the right of Archie Bunker and that was mostly what I heard and accepted as fact when I was young. I think we are making slow progress but still have a long way to go in that more people are at least cluing in to the fact that racist or ethnic jokes are no longer acceptable-I heard tons of them as a kid but rarely hear them now. The mainstream media contributes to the divisions by emphasizing the outliers; e.g. black violence, white racism and not on collaboration and cooperation. As Grace noted above, we view events through our own “filters” almost as a knee jerk event, and frequently do not stop to think how others may perceive the same event. I agree! If I were the author/artist of a comic strip, I think I would portray the people in the strip as I saw them based on my own experiences. But I would also have the freedom to portray people as I’d *like* them to be – The story line with the cop is a good example. No doubt we’ve seen that officer in many movies, but he is all too real for many readers of this strip who have experienced prejudicial thinking and behavior like this on a going basis. Imagine how different the story would be had the officer stopped to actually LISTEN at any point during the exchange instead of responding with his own snarky and inappropriate comments. I started reading this strip in October this year, and am enjoying it. There are universal themes: fierce moms, siblings who love – but still irritate – each other, for example. There are also thought-provoking strips: the November 2, 2018 strip with the Specter of Racism – how many times have we seen that stuff go on? And also the story line with the officer. Thank you, Tauhid, for doing this strip, whatever your reasons may be. Our comics are a slice of life from the times we live in – the good, and the bad. If they make us think on how we treat other people, that’s a good thing. Keep up the good work! The strip is still very young, and to answer your question succinctly; there will be plenty of well-rounded, savvy and good hearted white characters. Just like there are people in the world. However when telling these minority-centered stories, it is not my intent to take any pains to preserve anyone’s fragility. If it alienated some white readers, I suppose that’s a cost I’m prepared to pay. As for mainstream acceptance, I might go as far as to say that achieving that means either I’ve betrayed core principles of the comic or the world has changed dramatically over the life of the strip. As mentioned in the GoComics comments, I keep feeling like everything is happening in a vacuum. To be more precise, it’s like everything is happening on a theater stage, or on a scripted TV show, and we as the audience are being distanced from the events in the story itself. By only showing little vignettes of the isolated direct family members, minus any other relatives, friends, or social media (no protestors, no support systems, no reporters asking for the family’s side of the story, nothing happening on social media (even after the cop told them to record and post him online)), the strip feels like it’s operating in a bubble, and I don’t have an emotional investment in the characters. Is this intentional? And is it a prelude to writing Cody and the rest of his family out of the story? The clues were there. Good on you picking up on them. It also explains why Cody, his sister, or any of Jermaine’s older friends didn’t show up at the funeral – Mom hasn’t met them yet. The thing is, I’m a failed science fiction writer, failed comedy writer and ongoing cipher writer (it’s complicated). Plus, I’ve been following writers and comics artists for 50+ years. To me, the most important thing, as a writer, is internal consistency. It doesn’t matter if the story is mainstream fiction, SF, fantasy or mystery/horror, as long as the characters and action follow the internal rules created by the author. And, one of the first things I do as a reader is to try to identify those rules (and then abide by them when I post my comments on GoComics). It’s not so much a matter of suspending disbelief, as it is accepting those rules for what they are – the framework the story hangs on, and how the characters “see themselves.” As such, when the daydream sequence started, all kinds of bells and whistles went off in my head because that consistency was being violated. I fully expect characters to die in fiction. In fact, the way the author handles the death of a major character in the story is the difference between a great writer (ref. Neil Gaimon), and a wimp that wants to be loved mindlessly by their readers (ref. Jim Davis). And I think you (Tauhid) would write much differently if a major character were going to be exiting the strip, rather than it just being Shay’s daydream. On the other hand, Shay’s fears are real, and the way you portrayed them in this arc was near-perfect. Good work. I think you’re probably right. If this were a strip where characters regularly dropped like flies I would handle it very differently. And while there is room for permanent change in the strip, the death of a main character was never really in the cards. I can’t say if that will remain the case forever (the strip could evolve) but in the mean time death is still a theme that needs to be explored by the strip. In order to do so I leaned on a very real phenomenon. Any parent will tell you about the sudden, involuntary and traumatic fantasies they experience of harm befalling their child. It’s something I have gone thorough with my own child and continue to even now that she’s grown. The “dream sequence” is a dreaded trope, I know, but I indulged it for a couple of reasons. One was that I hope to actually inspire a measure of frustration on the reveal. I wanted to illicit real emotion in the reader, not just the surface emotion we reserve for entertainment. The actual emotion of lived experience. When a character dies in a movie it does not cause real mourning the way death does in real life. You feel sadness, but it’s a limited sadness that serves to enhance your enjoyment of the movie. However, the annoyance you feel at someone talking loudly in the theatre is a real emotion that also effects your experience. That’s kind of what I was going for when I constructed this arc. 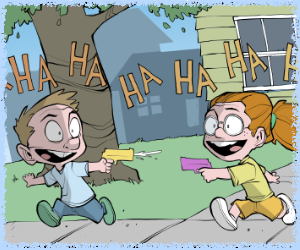 The fact is the story of a police involved shooting is one we all know and frankly don’t to NEED to be told again (although it’s a kind of story that’s generally missing from the funny pages). But to couple that story with real feelings of horror as the humor strip turns suddenly dark, betrayal as the jokes dry up, frustration as the arc drags on, helplessness as the dialogue vanishes, and uncertainty as you wonder if maybe this guy doesn’t know what he’s doing, and perhaps even anger as the it’s all revealed to be a fantasy; well that’s a different thing. But I did it because (though they are on a much larger scale) these are the emotions that people who live through the tragedy of police involved shootings go through. I thought it was a stylistic choice to convey a feeling numbness to your surroundings and how quickly the world at large moves on despite tragedies. Yeah, that was the problem. Too many people bought into that interpretation, making it impossible to suggest more (story-intrinsically) plausible alternatives. Well, and I always expect Tauhid to kill of a character in his jokey-jokes comics. I’m really curious to hear more about these clues when the arc is done. Are earrings involved? I do feel a bit derpy for not catching on to what was happening at some point before now, but the impact is especially amazing in terms of how long it went on (and to realize that it all occurred in a matter of seconds in her mind, as these things do). It’s also interesting to think about the other apparent “inconsistencies” with reality (flatline and no crash cart!) that are coming into focus now with this revelation too. The inconsistencies were both intentional and not. I took advantage of my own lack of precise knowledge about medical equipment, for example. The hospital room looks how Shay imagines it would. Things would be missing or out of place. But also sometimes I forget to draw earrings. The flatline and no crash cart or a code being called makes total sense now, was an excellent way to show the difference between reality and imagination, and I feel like I should have caught it at least at that point (though part of me did still rationalize that hospital malpractice might be piled on top of the police misconduct too — again, quite possible!). Anyway, awesome storyline! Thank you for the ride, Tauhid, and here’s to never compromising your values as you continue to express truth to power through A Problem Like Jamal. You know I think that may have been the same cop. This guy gets around, apparently. This has felt wrenching for me, an older white woman. I get a bit frustrated when people want the cop’s side, because I feel that is 90% of what we get in reporting. I have come to recognize that calling police if a young black man is around may end in a fatality. I need to be very thoughtful about when it is appropriate to call police. It is so helpful for me to see through a different filter than what I was raised with. Thank you so much for Jamal and his family. The recent mall incident in Alabama illustrates the pitfalls of the public’s expectations of immediate disclosure before all of the facts are known. The misidentification of a shooting victim as a shooter and the subsequent outrage may be a result of people wanting to know information before all of the facts are available. Then once there is a clarification or correction people become outraged and claim they were lied to or there is a cover-up. So far, I have not heard whether the officers involved were black or white or whether the victim (who reportedly had a concealed carry permit for his own protection) was brandishing a gun. Unless an individual is intimately involved in a case; e.g. immediate family member, there is no reason to demand the facts immediately after an event. Recent event in my community involved a home invasion with three killed-victims names had not been released pending notification of families but one of their “friends” blasted a name all over Facebook because it was his buddy and he felt the public had a right to know before the family. People wanting to get information that doesn’t directly affect them personally without allowing a reasonable (48-72 hours) timeframe for investigation are little more than gossip mongering agitators who are focused more on stoking their own importance than on the truth. Public influence certainly plays a part in these types of situations. And I have to admit that it can sometimes be puzzling when the public demands to know certain things. However I’d counter that police departments can sometimes have a reputation for corruption or circling the wagons with police involved shooting (we’ve all heard of the thin blue line). And that same thread of Protecting Their Own often weaves right through the entire criminal justice system. This unfortunate reality leaves victims of police brutality or other misconduct with little to no recourse for holding them accountable. At those times the only thing we can do is shine as bright a light on the situation as possible. It is unfortunately a very fickle and clumsy light but it’s what we’ve got. You illustrate the free pass injustice gets. First you illustrated the deadly consequences of victims of injustice then the powerlessness of the victims of injustice even if they survive. Is the point that one must survive a racist system? Is death at the hands of racism meaningless even if it is greivous? How do you fight for change without sacrifice, without facing power boldly though that power has the “justifiable” recourse of inflicting death. Excellent question. And I guess my answer is I wanted to illustrate the way most of these encounters go for most people. The average black person who has a sideways run in with the law does not see justice. The fact is it often goes pretty far the other way and people end up locked up erroneously or dead. Fighting that takes exceptional strength courage, and resources that the average person does not poses. It would have been nice to show Shay charging into the police department and dressing down the chief, lawyering up and taking her case to the Supreme Court. But that’s the stuff of movies. The more realistic story; the more familiar one, is honestly much sadder and more quiet. When people read this story I want their takeaway to be that of the countless people who suffer through police over-reach every day without the benefit of it sparking a social media movement or march for justice. I want people to think about what it means to have this kind of thing be an expected part of your existence. To have that helplessness woven into your Normal. Having them come out somehow victorious would have betrayed that. That said, you are absolutely right about what is required to effect change and I agree with you 100%. Hmm. Tauhid, for some reason, the “reply” tag is missing on your message above. I hope you don’t mind my starting a new thread here to continue the above discussion. I agree. And I’m glad you were able to enjoy the arc :). I don’t know about big bucks, though. I’m a little afraid that big bucks and making the strip I want might be mutually exclusive, in this case. But who really know?